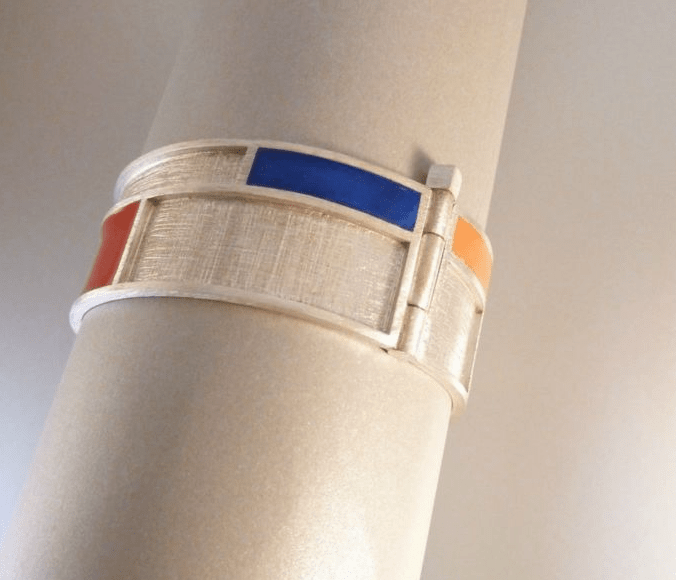 The geometric abstract style of Piet Mondrian is elegantly incorporated in this silver bracelet. A hand-made piece of jewellery of Silver 925 Ag in such a way that it looks like a linen canvas. 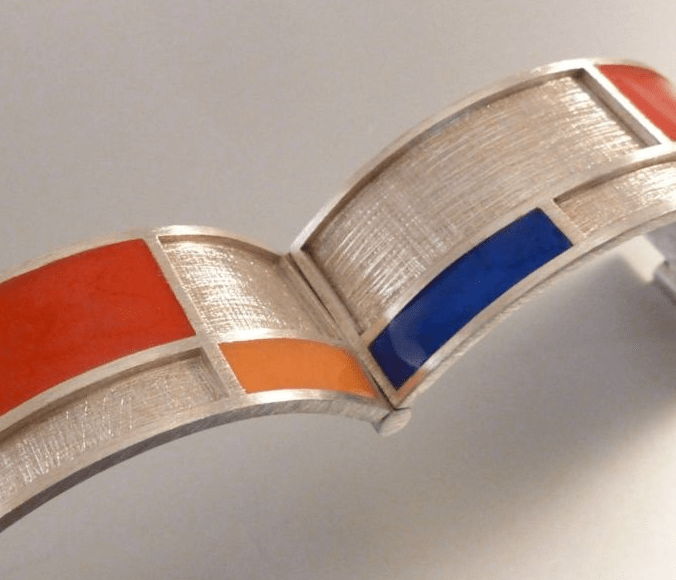 Six rectangles on the surface of this silver bracelet are filled with acrylic resin in the typical Mondrian colors red, blue and yellow. The bracelet has a inner perimeter of 19 cm and a width of 24 mm. An exceptionally beautiful ornament for your wrist. Contemporary and timeless in one. The matching necklace and earrings make the set complete. 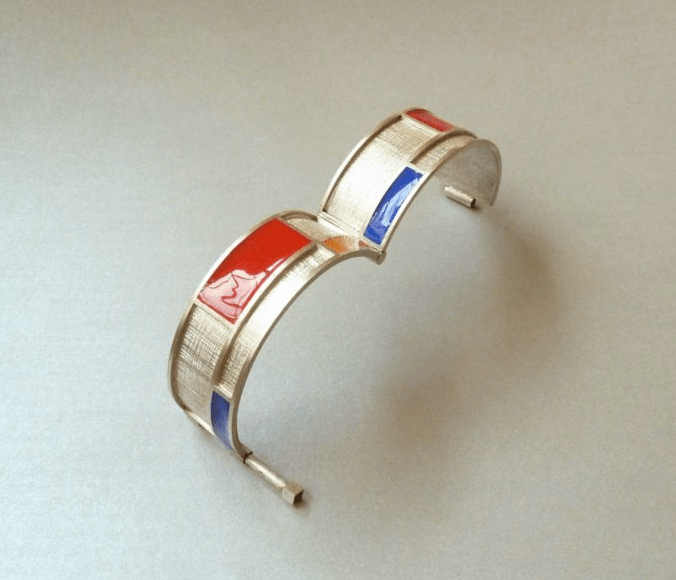 In this great silver bracelet by NobelJo you recognize the elegantly incorporated geometric abstract style of the Dutch painter and art theorist Piet Mondrian. This ornament is hand made of massive silver (925 Ag) and has a finely edited surface. On both sides of the bracelet 3 characteristic Mondrian rectangles are filled with acrylic resin in the just as characteristic Mondrian colours red, yellow and blue (no, it’s not Barnett Newman’s). The other rectangles are covered with a fine scratch effect, resembling a linen canvas. A beautiful wrist ornament, both contemporary as timeless. 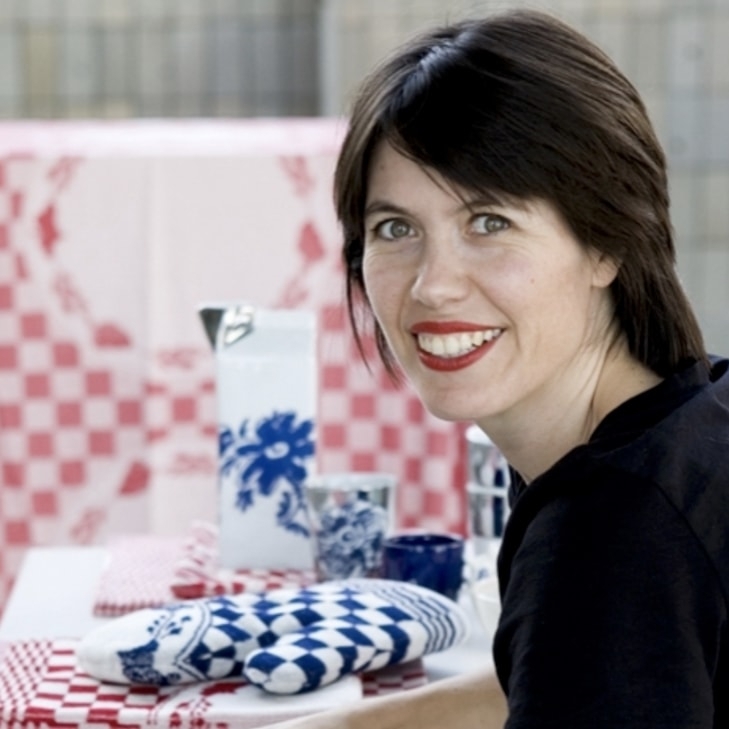 This design bracelet 'Wink at Mondrian' designed by Joke Kuiper-de Kock, is very suitable as a gift by the artistic and yet timeless design. A pinch of art to complete your outfit is a great gift to give and get. Design and finish make this silver bracelet a showpiece and great gift with a touch of Dutch for a wedding, a birthday, or … Aah, when you love her, there is always on occasion. 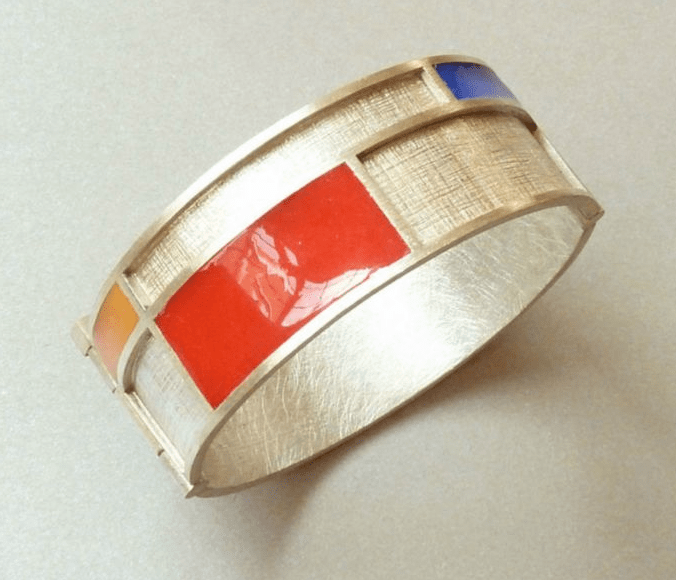 The Mondrian look of this silver bracelet stems both from the rectangle pattern and the use of red, yellow and blue acrylic resin to fill up six of the reactangles. Colour pigments are added to the in itself transparent Acrylic resin, which gives the colours depth. The resin is then dried and hardened with UV light. It is strong and smooth and you can clean it with water, soap and a soft toothbrush. When you want the jeweller to polish your bracelet again, it is no problem to put it in the polishing drum.